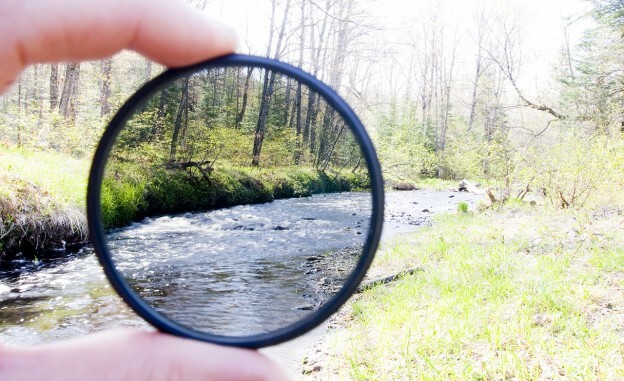 Photo courtesy of Flickr user Robert Emperley and used here by Creative Commons license. The premise of Eric Newton’s Searchlights and Sunglasses is that a world flooded with information requires a new type of journalist — one who filters information rather than shines a light on it. But the idea of the journalist as curator — one who sources, vets and contextualizes information other people report — has been hard for many reporters, newsrooms and journalism schools to accept and adapt to. "The reporting projects do not use citizen content only as a last resort. Instead, they work with citizens as collaborators in sourcing, investigating, and reporting stories." It’s not hard to imagine why. The vision of a curator at a desk monitoring Twitter and watching YouTube videos stands in stark contrast to the romanticized notion of journalist as fearless truth teller, dashing through The Field to get the story and get it firsthand. Yet many of the biggest stories of today are being reported by citizens on the ground coupled with journalists who find meaning in the trove — or deluge — of information. The reporting projects below do not use citizen content only as a last resort. Instead, they work with citizens as collaborators in sourcing, investigating and reporting stories. They curate citizen content by finding, verifying and presenting reports from the communities they cover and help their audience understand the larger story that they contribute to. They have resulted in consequential and award-winning coverage, and for journalism educators gathered at this week’s annual AEJMC conference, as well as newsroom editors and entrepreneurs, they provide models of innovation worth paying attention to. Every week on television and around the clock on its website, the network CNN-IBN curates citizen reports from across India on its Citizen Journalist show. The “CJ reports” cover places, communities and issues that are rarely seen in India’s crowded media landscape. Community correspondents have reported stories of minefields in Kashmir, laid off tea garden workers in West Bengal, rural villages whose schools lack basic amenities, and menstrual taboos. Producers and editors sift through video reports and tweets from their audience, and base programs on what their contributors send in. The program partners with several several civic action groups, such as Video Volunteers, an organization that trains individuals from India’s marginalized communities to report on issues affecting them. When inmates began sharing photos of dilapidated conditions at a Greek prison hospital this February, their reports on Twitter and Facebook caught the attention of a producer at France 24’s Observers. The program covers international affairs based on citizen reports that are curated and contextualized by its editorial team, with the help of the news agency Storyful. France 24’s Observers features many citizen reports from places that are otherwise inaccessible to the media. The producer contacted the inmate behind the social media campaign and was able to verify the accounts and learn the story behind the photos. The program credits and links back to the original citizens’ reporting and adds context based on additional reporting. A follow-up broadcast report included a prisoner’s cellphone video showing inmates suffering from diseases in overcrowded rooms and without medical aid. It’s one of several stories Observers has curated from places that are challenging for the press to access. Others have covered torture in the Central Africa Republic and violence against protesters in Tibet. The brutality of the Syrian war, coupled with Syrians’ access to cameras and Internet has led to a new type of conflict reporting, based on citizen journalism and open source investigation. When hundreds of people were killed in a chemical attack on a Damascus suburb last August, initial coverage relied on footage from citizen journalists on the ground and reporters and researchers internationally who worked to aggregate, verify and make sense of their footage. Plenty has been written about the verification process of the Storyful newsroom and the open source weapons analysis of Eliot Higgins, but the nature of this kind of reporting should not be lost on journalism educators and news innovators. While methods of citizen video curation and collaborative real-time investigation have developed out of necessity to monitor the Syrian war from abroad, these innovations exemplify the potential of curation reporting that can be applied well beyond the context of war. The participatory documentary, Sandy Storyline, engages communities affected by Hurricane Sandy to tell the story of the storm and the long process of recovery and rebuilding. Much more than an interactive documentary, the project involves community outreach, media education and live events to foster to an inclusive civic dialogue. 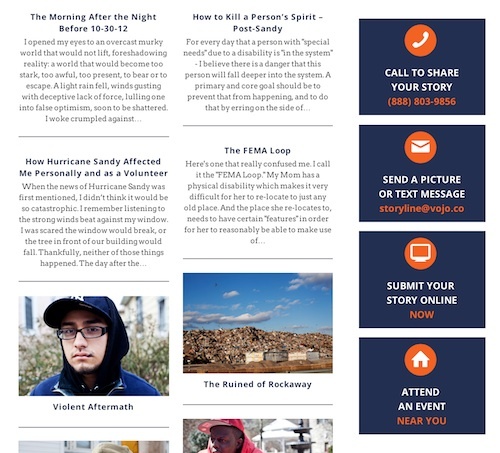 The stories are organized by medium and keyword and collectively present a stunning, intimate and diverse portrait of communities affected by Hurricane Sandy and their journey to recover from the storm. An online video alone often raises more questions than answers. Is it real? What is it actually showing? What happened before and after the clip? As citizens take on the role of gathering information from the ground, their reports form pieces of a larger puzzle. The value that skilled journalists can add is to find the pieces and put them together: source eyewitness footage, corroborate it with other information, and track down citizen reporters to learn more. That’s what John Carlos Frey and PBS’s Need to Know did for an investigation into the use of force by Border Patrol, in which two eyewitness videos of a man tazed to death by officers formed the centerpiece of the report. What these projects have in common is their approach to the communities they cover. “Citizen content” is not thought of as something to use only when professional footage is unavailable. Rather, the citizens behind that content are potential sources for original information and reporting. France 24 calls The Observers a “collaborative” program. Eliot Higgins has referred to his work as “open-source investigation.” Whether they are described as “curation,” “participatory,” “collaborative,” “open source” or some other kind of journalism, they are telling important stories with the skills of journalists and the resources of the public, in which everyone is a potential reporter. Madeleine Bair works at WITNESS, where she curates the Human Rights Channel, a Webby-nominated collaboration between WITNESS, Storyful and YouTube that curates citizen video of human rights abuse. Follow her at @MadBair, and follow the channel at @ytHumanRights. She will be speaking on the panel, “Media Policy and Participatory Journalism” at the AEJMC annual conference on August 7.